Chuck Lorre is making sure that Charlie Sheen won't be able to come back at Two and a Half Men, as the latter's character - Charlie Harper - will definitely be pushing up daisies. Two and a Half Men will be sober for a couple of minutes when it premieres in September, as Alan and Jake learn of Charlie Harper’s death. According to sources close to the show, Chuck Lorre is making sure that Charlie Sheen won’t be able to come back to Two and a Half Men — ever. The first show won’t be filmed until August 5. However, producers are kicking around scenarios that includes Charlie Harper driving a car over a cliff. In relation to this, there were rumors that Ashton Kutcher will enter the scene as a buyer of Charlie Harper’s house following his death. There were also rumors that the first script is not yet good to go, as Chuck Lorre makes changes often. 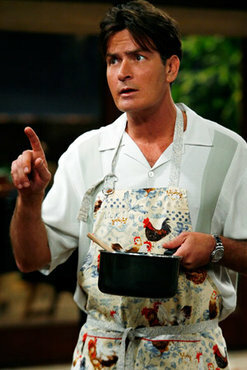 Regardless, Charlie Harper will definitely bite the dust. Charlie Sheen's Detroit Tour, Sold Out!